2018 has just begun and the weather is giving you a huge high five to the face with Melbourne’s first 40 degree day of the year. The Bureau of Meteorology (BOM) has forecast that there will be a low of 21 and a high of 41 on Saturday 6th January, 2018. The BOM say that it will be “very hot and sunny”. This means that you will want to find ways to reduce the heat this weekend. 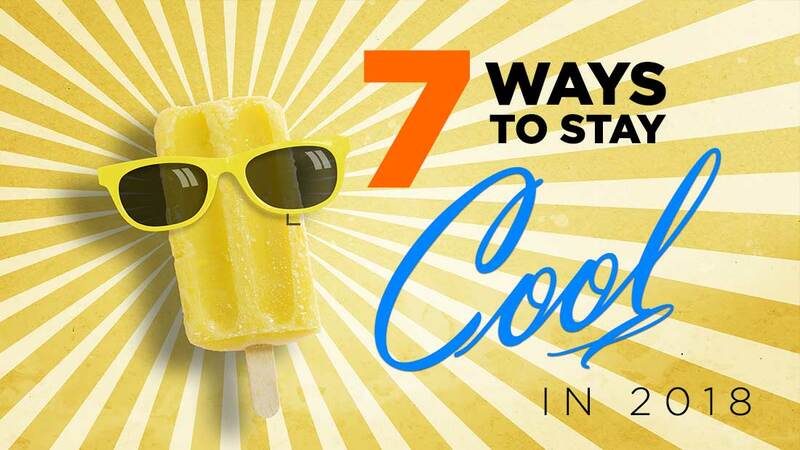 Here are 7 tips to stay cool in 2018. One of the easiest ways to stay cool in 2018 is to shut out the sun. This just means that you can close all your blinds and curtains. This will keep out a fair amount of sun and heat from entering your home. Slip on a hat. Slop on some sunscreen and slap on a hat. While it isn’t advised to go outside when the weather reaches more than 40 degrees, stay sun safe if you have to leave the house. Staying inside with high temperatures is the best way to stay cool in 2018. With high temperatures comes a higher risk of dehydration and heat exhaustion. To make sure that you decrease these risks make sure that you drink lots of fluids. Alcohol can leave you more dehydrated so lean more towards water and drinks that contain electrolytes. This is because you will need to replenish electrolytes that have been sweated out in the heat. If you have air conditioning, crank it up. It will leave you feeling cooler and will allow you to be more comfortable during the day. Remember that you will need to service your air conditioner so that it is working at optimum rate on days like this. You may want to read 10 tips for using your air conditioner effectively. Loose, light weight clothing made of cotton is best for sweltering hot days. They don’t stick to you. They allow air to flow around you which will help you to stay cool in 2018.You will also feel cooler if you wear light coloured clothing as opposed to darker ones. When in a fire we are taught to get down low and go, go, go. This is because hot air rises. So when the heat is reaching the highest limits we will find that the air is cooler nearest to the ground. If we lay on the floor, especially on tiled floors you will feel cooler. Many pulse points can be found in your feet and ankles. It makes sense that if you keep these areas cool, they will assist in making your body feel cooler too. So throughout the day dip your feet and ankle in a bucket of cold or ice water so stay cool in 2018. Contact Plum today on (03) 8360 9622 for all your air conditioning needs. Have you read up about our Eco-Clean System?